Deputy Speaker said he would consult on the matter with Speaker Kadaga on Thursday morning before a decision on tabling the controversial bill is made. Courtesy photo. The Deputy Speaker of Parliament, Jacob Oulanyah, has warned legislators against using Parliament as an excuse to incite the public on matters of age limit removal. At a time when a section of NRM MPs are planning to draft a private members’ bill to amend the Constitution to amend Article 102 (b) to remove the Presidential age limit, Oulanyah revealed that the decision to move the motion will be made on Thursday after consultation with the Speaker of Parliament, Rebecca Kadaga. The prayers of the motion to be moved by Igara West MP, Raphael Magyezi, are to seek leave of Parliament to draft a bill to amend the Constitution to remove the 35 and 75 year age cap for presidential candidates. The decision to bring the bill was passed during a consultative meeting last week at Parliament, convened by NRM MPs under the leadership of Parliamentary commissioners. The MPs agreed that Article 102 (b) is retrogressive and blocks out able Ugandans outside the age cap who wish to vie for the Presidency. However, Oulanyah in his remarks to the plenary today expressed concern over the anxiety that the debate by MPs on the age limit had created among members of the public. He also dispelled reports that the motion would be tabled on the floor, stating that he would consult on the matter with Speaker Kadaga on Thursday morning before a decision is made. He cited an incident today during the launch of the report of the Equal Opportunities Commission, where the person who introduced him said the Speaker had to rush back to Parliament to attend to the plenary which was expected to be “hot”. 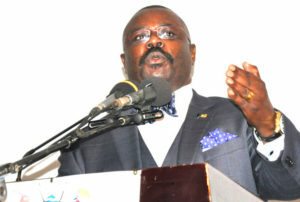 Oulanyah said Parliament will discuss all issues in a fair and open manner, with no pressure. The Deputy Speaker also revealed that he had received a notice from a group of MPs seeking to move a motion to urge government to set up the Constitutional Review Commission (CRC) to conduct public hearings on the constitutional amendments. “None of these motions will come to this floor until we have a discussion with the Speaker on Thursday morning about the two notices. If it requires the Business committee to determine what happens, then the committee will sit but if by the authority of the Speaker and the meeting it is necessary to schedule it for business, then the business will be scheduled for Thursday afternoon,” Oulanyah said. Some legislators, including Rukungiri Municipality MP Roland Mugume took the opportunity to question the heavy deployment of police around Parliament since yesterday. Mugume also bemoaned the arrests of legislators, including Makindye West MP Allan Ssewanyana and the summons issued to MPs Theodore Ssekikubo, Barnabas Tinkasimire and Mohammed Nsereko. Only Nsereko and Ssewanyana appeared before CID in Kibuli. Oulanyah warned the legislators against inciting violence through statements they make at Parliament, warning that it will not stop the police from arresting them. “I have watched a clip on social media where a member of this House is calling for war in this House; that there is going to be war. Now when you make these public statements, you make this House a possible scene of crime. When you do that, how do you stop the police from deploying? As Speaker I don’t have to call the IGP,” he said, amidst laughter from MPs.